Mobile social networking is definitely going to be huge. Social networking giant Facebook announced its mobile userbase has expanded from 5 million to 15 million since the beginning of 2008. Writing on The Facebook Blog, Facebook mobile team engineer Wayne Chang adds that in the 24 hours after the site began allowing subscribers to comment on their friends' status updates to the Facebook mobile site, users posted close to a million status comments. Chang adds that Facebook is in the process of expanding its mobile staff, and promises new improvements are forthcoming. 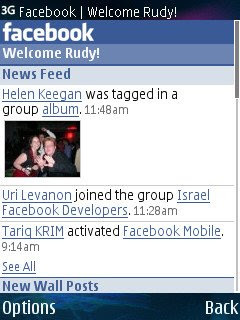 I m definitely looking forward to the new improvements as i have been on Facebook Mobile from day one when it was launched. Its certainly one of the best way to update your status. If you are constantly on mobile and have a data plan in place, go check out Facebook Mobile. I manage an Australian Mobile Phone Network and was hoping you would be open to a link exchange? Email me at chris.hamilton @ omg.com.au so we can discuss it further.